Little J is all about baking these days. Thanks to Sylvia Chave's Cookie Cutter Song, from her new Orange Album, he most often asks to bake cut-out cookies. It's somewhat anti-climactic to have to wait an hour or two as the dough refrigerates. 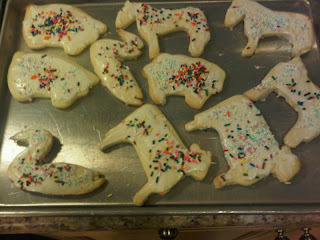 So, I was excited to find this recipe for cut-out sugar cookies that doesn't require refrigeration! This recipe is adapted from the Wilton Cookie Blossom Sugar Cookies recipe found on Food.com. 2. In large bowl, cream butter and sugar with electric mixer for two minutes; scrape down bowl. 3. Cream the mixture for an additional minute. 5. Sift baking powder and all-purpose flour if not using self-rising baking flour. 9. Bake until cookies are lightly browned, about 8 to 10 minutes. 10. Remove cookies to a rack to cool completely. This is the powdered sugar icing recipe I tried out with the farm-animal cut-outs (purchased at Peevy Mart). The results were delicious! Or, I just used the store-bought stuff to make it quick and easy for Little J and I to decorate Christmas cookies for friends. Thanks Laura! This is a very yummie cookie. My family thinks so, too! Glad you are enjoying the recipe.